nothing makes me happier than that picture you see here now. it’s called fran winning his weekly poker game. here’s why i love poker—win or lose i have absolutely no one but myself to blame or pat on the back. all the decisions i make i’m responsible for thus if i lose it’s my fault (and i kick myself for it) but, if i win it’s all me. ahhh if only everything i was involved with worked this way—bands, businesses etc etc. is this what it’s like to be a dj? 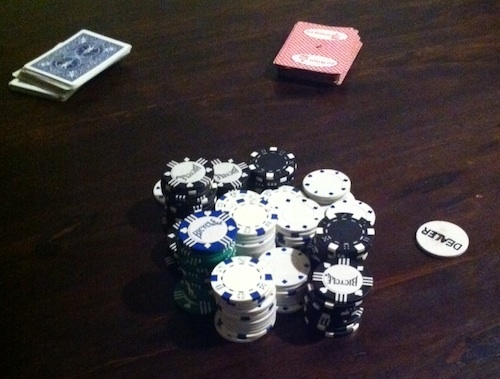 again – quality poker is a combination of good decisions plus a big dose of luck. avoiding the walk of shame is so much fun. not exactly sure where i was going with this title…deep down i’m not really a big fan of dj’s just cos i’m a “band guy” but i see their collective utility. i wish every dj was a wedding dj cos they’re more fun. a weeding dj however would be interesting though…garden parties anyone? Posted on Friday, August 12th, 2011 at 10:34 am. Filed under: poker RSS 2.0 feed. i’m guessing not too big How Long – although kudos to you for even replying/reading this post.